Temeka Johnson is the official replacement for Caroline Aubert at USO Mondeville. She is a member of the 2009 WNBA champion, Phoenix Mercury, and has played in the WNBA since 2005. She played for Maccabi Ashdod in Israel this season and averaged per game 13 points and 5.6 assists in 30 minutes. 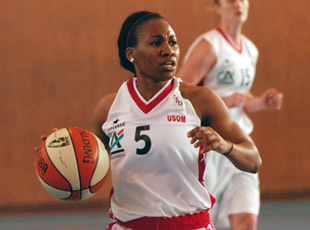 Johnson has already made her début in a friendly match against Roche Vendée (82-48). Her arrival ended Belgium international Marjorie Carpreaux' short stay at the club. At Challes-les-Eaux, it is official that the season of Silvia Bedu-Janostinova (right) is over. She has been out of action for several weeks and will be replaced by Ivanka Matic. Matic had played in France before with Aix-en-Provence (2004-2005) and USO Mondeville (2005-2006). After her time in France, she played in Russia, Spain and the Czech Republic. She returned to Serbia this season and played for Crvena Zvezda Beograd. Mandisa Stevenson returns to France for a month as medical replacement for Khadijah Whittington at Montpellier. Stevenson had played in the LFB before with Nice and Saint Amand. She was playing in Latvia with SK Cesis this season. Emma Randall and Natasa Ivancevic are the other news players for 2010. Marion Laborde (left), the captain of Basket Landes, is back in training and expected to make her return by the end of January. Laborde suffered knee ligament damage while playing basketball for her university at the end of last season. Ana Lelas from Bourges Basket is also expected back this month. Essence Carson, her medical replacement, has a contract until the end of January.